Samsung Korea has announced that it will release the phone formerly known as the Galaxy A8s for sale in the country in February. To date, this punch-hole display phone has only been available in China. 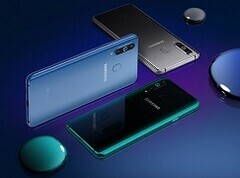 It will be re-named the Galaxy A9 Pro (2019) for its new market, and cost approximately US$535 on its South Korean debut. The Samsung Galaxy A8s has fiinally made it out of its original market (China), and will also be available in South Korea soon. This is in accordance with an official statement made by the OEM's Korean division. The announcement also confirms earlier rumors on the same subject. For a mid-ranger, the Galaxy A8s may be of particular interest to consumers in this country. It is the first device to use Samsung's new Infinity-O technology, which gives the A8s a punch-hole camera set into a corner of the display. However, the Galaxy A8s will have a new name in its new market. It will be rebranded as the Galaxy A9 Pro. Then again, there is already a phone of that name, which was released in 2016. Therefore, the updated Infinity-O version will be the Galaxy A9 Pro (2019). Like the Chinese variant, it will have a triple rear camera, a 6.4inch FHD display, the Snapdragon 710 and Android 9 (Pie) to go with its next-gen frontal sensor arrangement. The Galaxy A9 Pro (2019) will be released in 3 color SKUs (grey, blue and green/black) when it gets to South Korea. Sales of this phone will go live on February 28, 2019, at which point it will be priced at 599,500 won (or about US$535). It will be useful to see how well this goes, as the new Galaxy A9 Pro's performance could determine its chances of getting into more global markets in the future.